When my friends in our chapter of OCF told me about the Great Lakes retreat, I was initially very hesitant go with fall semester crunch-time descending upon us. In the end, however, I decided to go with them because the retreat was not only the weekend of my name day (the feast of St. Demetrios), but also the weekend of the 40-day memorial of my godfather, named Demetrios, who shares my patron saint. It seemed like a good time to say, “Homework can wait. I need to focus on God right now.” I am so glad I did. 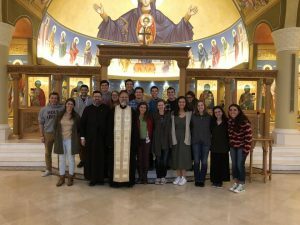 The first evening of the retreat, we had a Paraklesis service at St. George Orthodox Church in Fishers, Indiana, opening our time together in prayer. Then we played icebreaker games before heading over to the house on the parish’s property, which they graciously provided for us to spend the night in. We stayed up late sharing our stories with each other, making up songs together, and confiding in one another about our struggles, questions, and concerns that are currently heavy on our hearts. 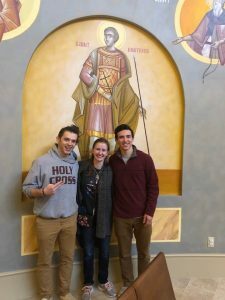 The second day, which we mostly spent at Holy Trinity Greek Orthodox Cathedral in Carmel, Indiana, largely focused on the discussion of our assigned topic, “Thou Art With Me: A Present God in a Broken World.” Mr. Niko Tzetzis gave us a fantastic presentation about Fr. Stephen Freeman’s book, Everywhere Present. In this book, Fr. Freeman explains the “two-story universe” theory. He states that the American culture in the 21stcentury conditions us to operate under the assumption that we live on the “first floor” of the universe, and that God lives on the “second floor” above us. Exiled to this distant second floor, God seems far from us and we rarely interact with Him except to ask Him for things. Our discussion led by Mr. Tzetzis was more impactful than just buying the book and reading it alone (though I highly recommend the book, I’m reading it now!) because we were able to speak to our specific, personal, and unique challenges in finding and acknowledging the constant presence of God. We worked together as individuals and as a group to find ways that we can increase our awareness of the fact that God does live on the “first floor” of the universe with us, and that He is present with us everywhere, always. Along with the discussion of our topic, we had a service event! We cut up old plastic bags from grocery stores—which we had all saved for this event instead of throwing them away—and learned how to tie them together to make waterproof mats for people experiencing homelessness to sleep on. This event was a wonderful idea because it’s a practice that we can take back to our colleges, parishes, and OCF chapters. It is good for both the people receiving the mats and for the environment by reducing plastic waste! There are many moments I will never forget, and I could write about this retreat for a very long time, but one moment stands out. On the second day, we put our phones away and had 10 minutes of quiet time in the nave at Holy Trinity. After this quiet time, Mr. Tzetzis gathered us all together and said, “I don’t know if you’ve heard…” My stomach immediately sank. He told us about the senseless violence that had occurred earlier that day at a synagogue in Pittsburgh. Immediately, led by the priest at Holy Trinity, we prayed the Trisagion Service together for the victims. Mr. Tzetzis reminded us afterward that when we pray, we are praying simultaneously with the angels, the saints, the departed, and our Lord. They are all present with us everywhere and always in the reality of our one-story universe. While I originally debated about attending the retreat, I’m overjoyed that I went. The power of the lifelong friendships you form and the spiritual refocusing you experience at OCF events is not to be underestimated. Yes, we have homework, jobs, hobbies, other student organizations, and every other worldly distraction you can think of. 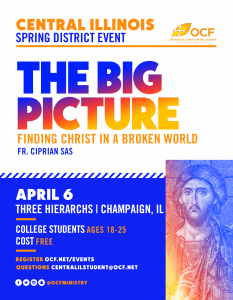 Despite these distractions, please always take the opportunity to attend OCF events, including but not limited to your regional and district retreats, College Conference, and Real Break. I promise you, whatever you give to OCF and to the Church, even if it is only your time, attention, and presence, you will receive back multiplied. My name is Demetra Chiafos. 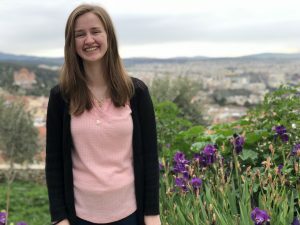 I am currently a third year at The Ohio State University, where I am the secretary of our OCF chapter and am pursuing a dual degree in dance and the Japanese language. Two fun facts about me are that I play the piano and I love writing short stories and novels! ← Why Should I Stop and Smell the Flowers?